Of course, many collaborations are simply natural combinations of interest and talent between researchers who’ve known each other for years. Dr. George Cobb, professor and chair of environmental science in the College of Arts & Sciences, arrived at Baylor in 2011 to take over the reins of the department, having already been a close colleague of Dr. Bryan Brooks for years. Brooks had landed at Baylor almost a decade earlier, and it was partly on Brooks’ recommendation that Cobb was brought in as chair. Doing right by the students has always been a core principle for Baylor faculty, but the dean’s choice of chair turned out to be a good fit in other ways too. 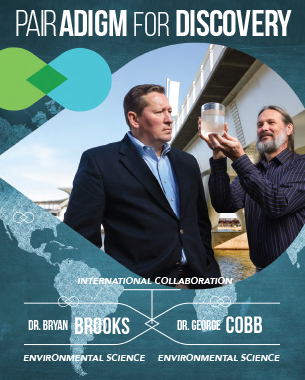 Cobb had been collaborating internationally for years before coming to Baylor. At the same time, Brooks had long recognized that environmental problems can’t be constrained by borders—or even confined to continents—and had begun steadily building an international presence and reputation. “When I got here in 2002, I was working on some topics that really nobody in the U.S. seemed to care about, but in Europe they were a big deal,” Brooks says. “So I asked the dean for some travel money so I could go interact with the Europeans, primarily. We’re working on five continents now and developing a proposal for a sixth. During Cobb’s tenure, those early treks across the Atlantic have led to active agreements, research projects and exchange programs with several countries in Europe, Latin America and the Pacific Rim, where researchers have just wrapped up a project in New Zealand. They recently secured the first research funding between Baylor and Hong Kong Baptist University, a long-time sister institution. Other faculty members are initiating air and water quality projects with colleagues in China. In addition to the reams of good science coming out of these arrangements, they have opened a pipeline for stellar exchange students who want to study at Baylor. “We’ve recently had two students from Latin America come work with us, and a third is coming this fall. There is a Ph.D. student from New Zealand and a visiting Ph.D. student in the lab right now from China—she’s already published!” Brooks says. In whatever way research partnerships may form, Baylor researchers find their talents and experience multiplied and magnified by a natural combining of complementary experiences and interests.